Commtech Chip (No. C2): R2-D2's Commtech Chip includes 6 different sound effects in an information dense electronic language that sounds to the untrained ear like beeps, boops, chirps, and whistles. Comments: While repairing his new droid R2-D2, young Luke Skywalker unwittingly short circuits its recording system, causing a holographic image of the young Princess Leia to appear. She implores the help of Obi-Wan Kenobi, and then disappears as quickly as she emerged. 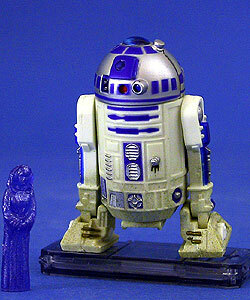 Point of Interest: This version of R2-D2 originally came with a circular peg for the "ankle" articulation. This was later changed to a more accurate half-circle peg. 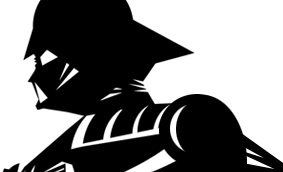 Of the two variations, the original round peg version is much more difficult to find.